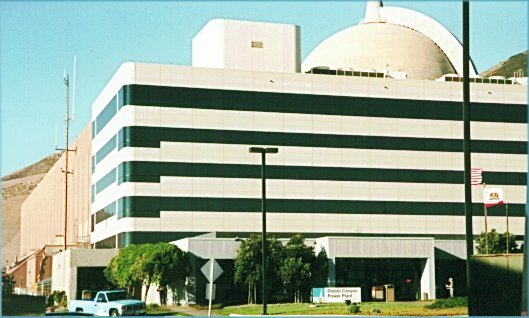 The Diablo Canyon nuclear power plant, owned and operated by Pacific Gas & Electric, has 2 Westinghouse 4 Loop Pressurized Water Reactors, each rated at 1000 MWe. The 2 units followed on the experience (1963 - 1976) gained from operating PG&E's initial 63 MWe unit 3 at Humboldt Bay, near Eureka. Construction for the 2 units started in 1968 and 1970. However, regulatory and intervention legal hurdles delayed the units from going commercial until 1985 (Unit 1) and 1986 (Unit 2). A number of simplified diagrams illustrating the design of this pressurized water reactor plant (courtesy Westinghouse) are provided on the PWR Cycle page. Each reactor has193 fuel assemblies of the 17x17 design with 264 fuel rods per assembly. The containment is a large steel structure rated at 47 psi pressure. Each reactor coolant loop has 1 U-tube vertical steam generator (with over 3000 tubes) and 1 reactor coolant pump. Each unit has a pressurizer connected to one of the 4 loops. Normal makeup water is provided by 1 of 3 Chemical and Volume Control System charging pumps. A smaller positive displacement pump is rated at 98 gpm and 2510 psi. The 2 centrifugal charging pumps, each rated at 150 gpm and 2510 psi double as the emergency high head safety injection system pumps. Their shutoff head is 2565 psi. On the non-radioactive secondary side of the steam generators, condensate-feedwater is supplied by 3 condensate pumps (190 psi), 3 condensate booster pumps (415 psi), and 2 turbine-driven feedwater pumps which move the water from the condenser to the steam generators. Pressure and temperature are raised from vacuum and 90F to 1100 psi and 425 F.
2 Low head safety injection (Residual Heat Removal) pumps rated at 3000 gpm @ 155 psid with a shutoff head of 165 psig supplied from the 454,000 gallon Refueling Water Storage Tank. 2 High head safety injection pumps rated at 415 gpm @ 1250 psid with a shutoff head of 1535 psid supplied first from 1 of 2 8060 gallon Boric Acid Makeup Tanks, and then from from the 245,000 gallon Refueling Water Storage Tank. 2 Intermediate Head Safely Injection system pumps each rated at 425 gpm and 1085 psi with a shutoff head of 1520 psi. 2 motor-driven (100% capacity and 1 turbine-driven Emergency Feedwater pumps supplied from a 150,000 and 500,000 gallons Condensate Storage Tanks with the Pacific Ocean as the Ultimate Heat Sink water source. 3 Diesel generators (only 2 needed) for each unit; 12 KV Standby Startup Transformer can be fed from either unit.